Well it's my birthday too (and Gerrie's, and Shelly's and Sharon's and Shelley's)! Happy Bloggers Challenge Friday! Okay, so today isn't actually "our" birthday, we all celebrate our birthday on Monday, March 15th, but what better way to kick off a birthday than with some virtual birthday cards for me and my friends! Here's a few fun facts, Monday is also my Mom's Birthday (Happy Birthday Mom! ), all the gals I've mentioned celebarting birthdays with me, I've had the pleasure of working with at Artistic Outpost. So, what's the something NEW you ask? 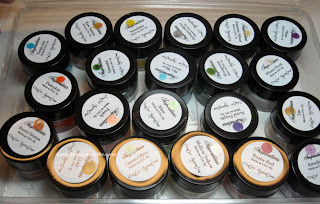 Well, I'm excited to tell you that I'm now designing for Creative Inspirations, and my beautiful paints just arrived. Creative Inspirations carries easy to use paints with vivid color and bling that make your projects sparkle. These paints are non toxic, just shake, open and paint! My creative jucies have been flowing with ideas on how to use these paints for more than just adding bling to your images. You can add a bit of Creative Inspirations Paint to a waterfilled Mini Mister and create your own Shimmery Sprays, dye your ribbons and flowers, create your own paint pads! Yes you can actually stamp with this paint! To keep my paints organized, I dipped a pencil eraser into the paint and taped it onto the label and let dry. Now when looking at a glance I can see all the colors at once. I'm currently storing them in an empty Clear Stamp Box. (click photo to enlarge). 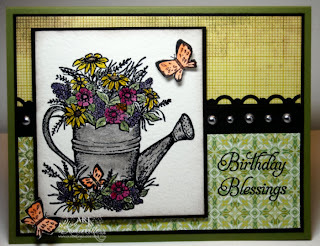 The beautiful Watering Can from ODBD Happy Birthday set is stamped in Black then clear embossed on Watercolor paper. I used an H20 Brush and Creative Inspirations Paints to color the image. The butterflies are painted and popped on dimensionals. Looking for more birthday inspiration? Click on the Bloggers Challenge Logo on my sidebar to see what the other players created this week. Want to play along, simply leave a link to your project when leaving a comment, I'd love to see what you created! Have a great weekend! If you're going to the Stamp Show in St. Charles this weekend, stop by and see me, I'll be helping out at the Our Daily Bread Designs booth! oh lisa so pretty!!! and SUCH a great idea on seeing the color - DUH moment for me! might have to do that one myself this weekend! you know in my spare time ACK! Wheeeeeeeee!!!! Happy Birthday Lisa. I love your new paints. Gotta have 'em! OUTSTANDING! Love the image and the card, but you description of these paints makes my mouth water -- I'll have to check them out! Happy Birthday! Beautiful coloring Lisa - love the image too! Happy Birthday friend! HAPPY BIRTHDAY LISA! I hope you have a WONDERFUL day!!! Your card is STUNNING! Love the colors - the layout ---PERFECT! TFS! 1st...HAPPY BIRTHDAY! Love the card and I can't wait to see all the creative uses you come up with for the new paints! Happy Birthday Lisa!!! I bet this card is so sparkly in person. Beautiful card!! Gorgeous card Lisa- fantastic colors- I love the way you put a dab of color on the top of your paint. Wow- gorgeous stamp!!! I may see you on Sunday in St Charles- I have a wake to go to, but am going to try to head out to the show early. Have a great day! So Gorgeous! Love the glitzy Paints!!! This is soooo wonderful!!! Happy Birthday Lisa!!! Thanks so much for joining us at Going Grey with ScrapCreations this week! I love watering cans! This is beautiful! Happy Birthday! Thanks for joining us in the Basic Grey Challenge. I hope to see you back next week. First HAPPY BIRTHDAY to you Lisa and all the others celebrating on Monday (that's quite a group). Second your card is wonderful. Love the watercan and flowers. Super pretty. Happy Birthday!! Love your card!! and I'm a big fan of Creative Inspiration paints..they are so awesome! Happy Birthday Lisa! Beautiful card!!! You've used the paints marvelously! Hope you have a wonderful, wonderful day, Lisa! Enjoy it and relax! Hugs! ----Happy Birthday---- as always, your card is GORGEOUS!!! and how cool are your new paints... Thanks for playing this week! Lisa, this is beautiful! Love the colors, patterns, and detailing! The sparkle is fantasti and the paints are wonderful...great tip, too! Thanks so much for playing Stamping In Time! Have a Great Birthday and a Blessed Year! Wow! Lots and LOTS of birthdays! HAPPY BIRTHDAY, Lisa! I hope you have a wonderful day. Your card is beautiful! New paints...wow! Thanks for being a great BC mom! ANNOUNCEMENT---I hear it's your birthday!!! Well, almost that is! Hope it's a great one in every way possible. 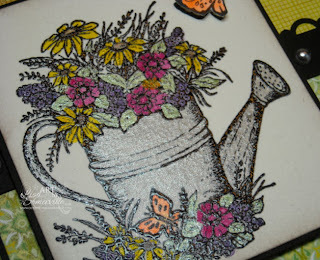 What a beautiful card--love the flowers in the watering can--it's almost overflowing--we are so ready for Spring to arrive! Happy Birthday Lisa! Love this card! Happy Birthday Lisa. Those new paints look marvelous..and your card is awesome as usual.. Happy Birthday girlie! Oh this is so pretty! The paints sound like so much fun! Happy birthday Lisa!!! AND I love your card!!! Super duper pretty!! I love this card & colours. How pretty! Love the shimmer on the watering can. Hope your birthday was great! Hope you're still celebrating your birthday. Love your card.